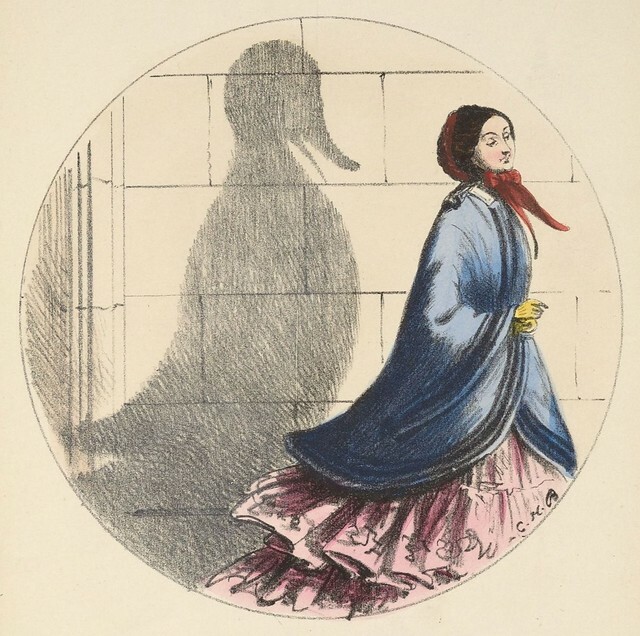 "Charles Bennett (1829-67) was a talented illustrator who worked mainly as a caricaturist for periodicals such as the Comic Times and Comic News; he joined Punch in 1865, but died in poverty only two years later. 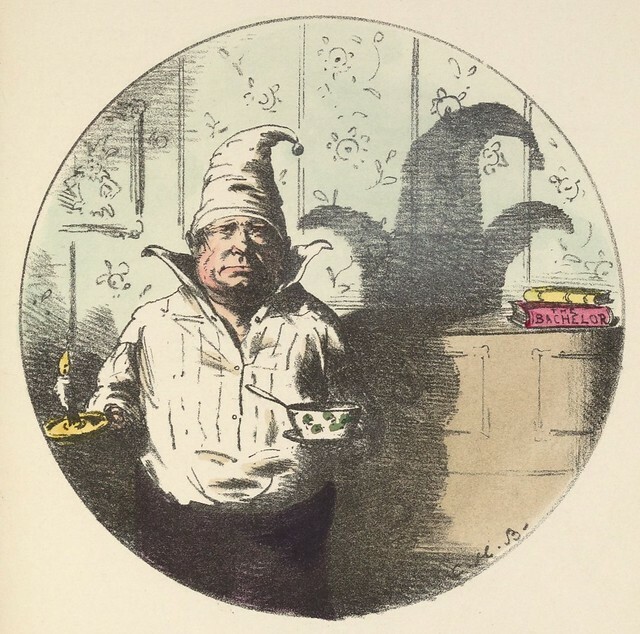 He wrote stories for his own children and illustrated them with delightful comic details, often cutting his own wood blocks." 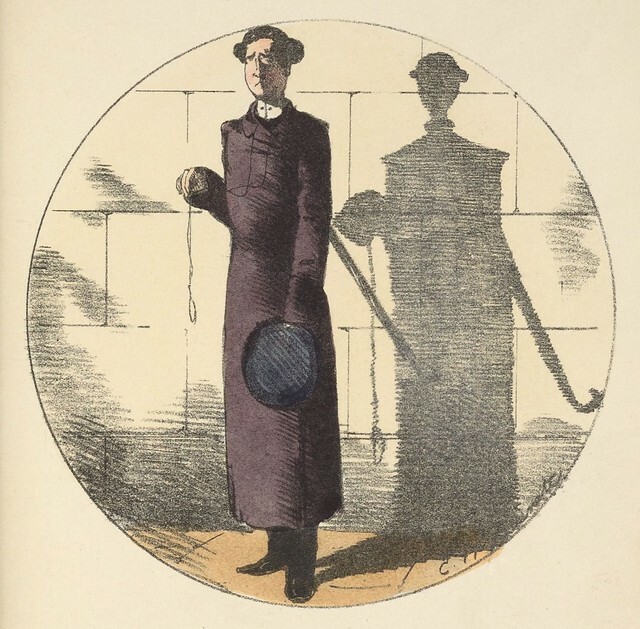 "He also illustrated children's books like 'Papernose Woodensconce' (1854), 'The Faithless Parrott' (1858) and 'Mr. Wind and Madame Rain' (1864). 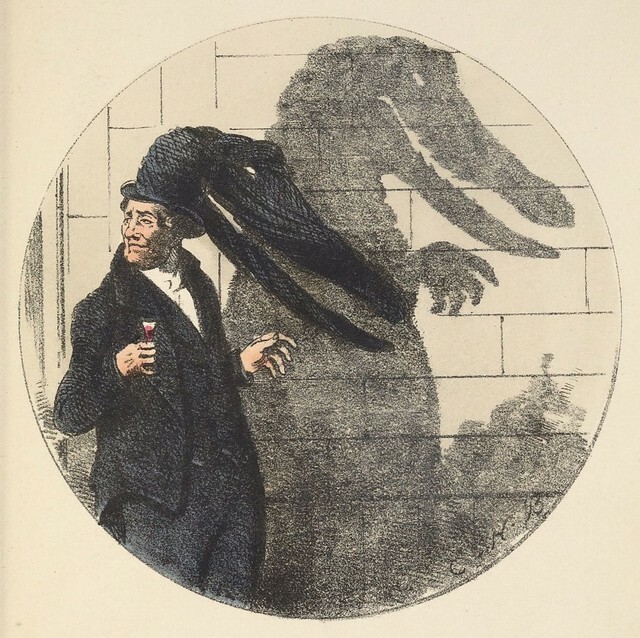 The stories Charles Bennett drew for Punch often showed a sequence, and can be seen as an early form of comics." 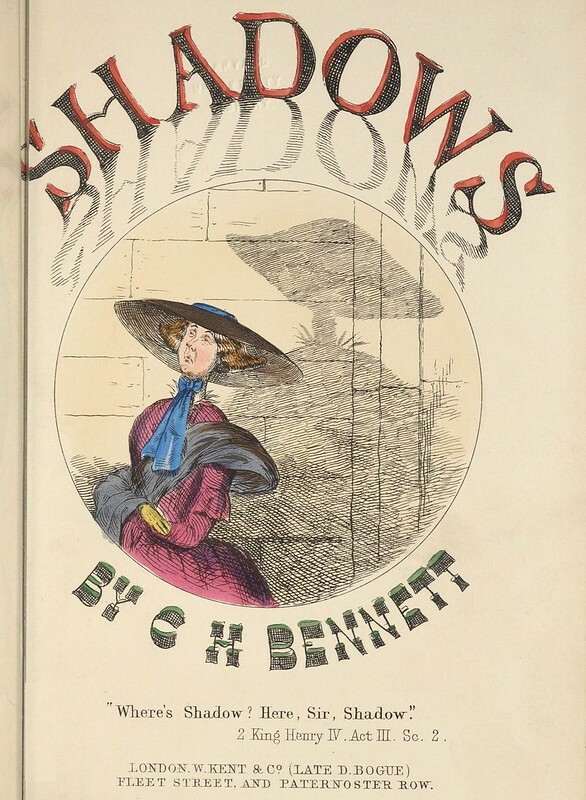 'Shadows' by Charles Henry Bennett was published in London in the 1850s and has been digitised by Widener Library at Harvard University. 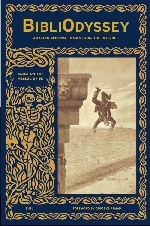 It contains about 24 coloured lithographs and was the first volume from (I think) a 2 or 3 book set. 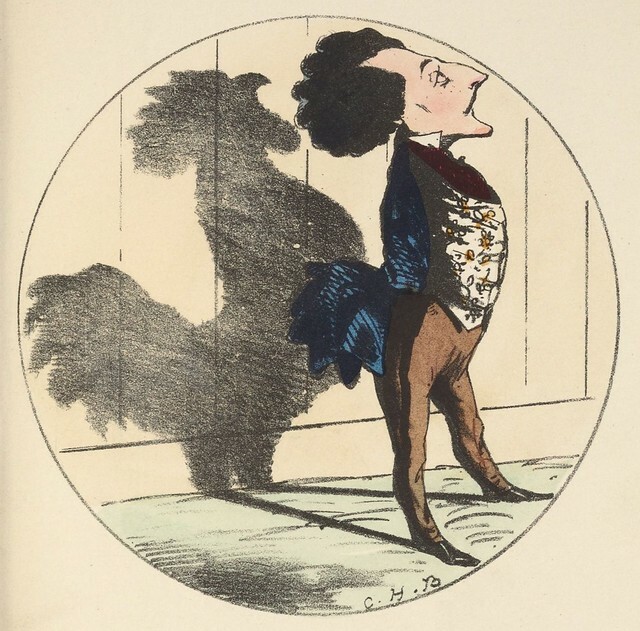 The caricatures were quite popular at the time for the comical way they allegedly revealed the subject's true character through the shadow cast. Via Tip of the Iceberg: Unique & Unusual Finds at the Harvard Library. Wikipedia article on CH Bennett. There are references to Bennett all over the place, but none are particularly comprehensive. He was a prolific and versatile artist who is regarded as a pioneer in the comic illustration form. You can get a bit of an overview of his range from a google images search. 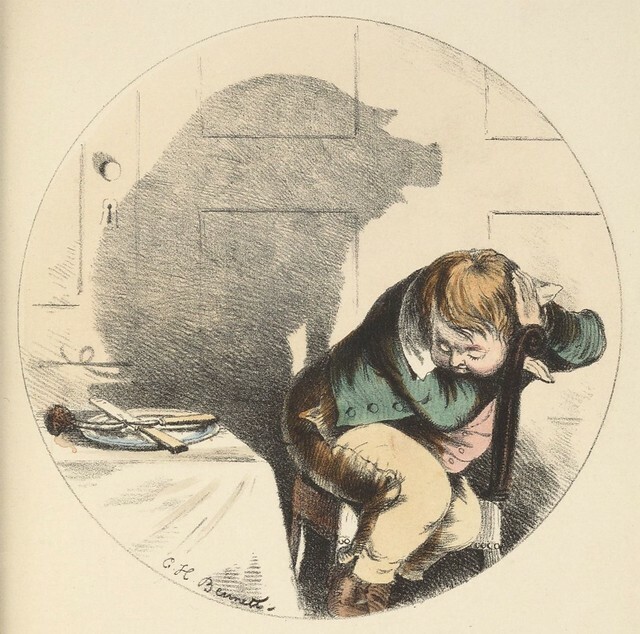 **The Shakespeare passage^ up top has Richard being reminded by a mirror ("glass") that he is always on stage and that a reflection, like a shadow (metaphor), is divorced from the true nature of character portrayed in reflected or shadowed form. I'm slightly confused by the Old Fashion. Otherwise, can see these will be a big hit for entertainment next time there's a power outage in my neighborhood. I wasn't really sure about that fashion part either. 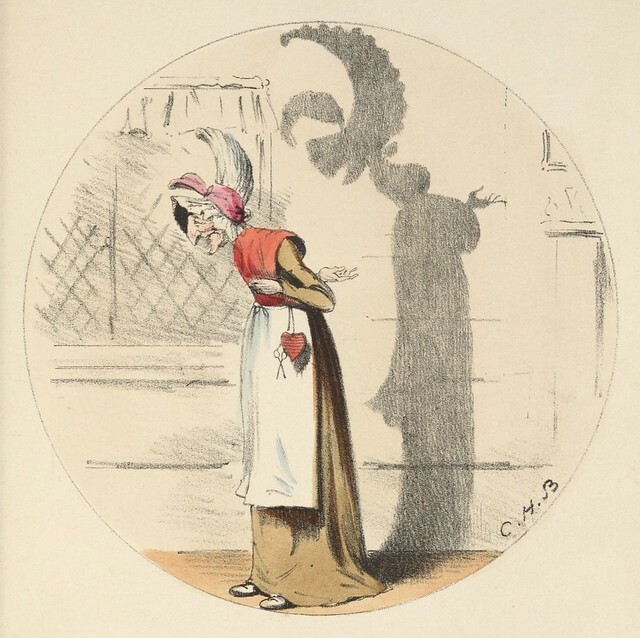 I thought of the mega-bouffance styles of 18th c. France, but all the rest of the visual puns are derogatory comments on character, so it remains a mystery to me. "Yes, I kept trying to figure out if there was a discernible resemblance to empire style, but it didn't seem quite right. Perhaps it will come to me in the night. The pump took a moment--physical pump for water as opposed to some sort of unfamiliar slang." Internet woes your way as well? I thought it was just here... lots of DNS errors (or whatever they're called). Servers intermittently fried. I don't get the pump --is there a symbolic meaning I''m missing? Otherwise, this is one my favorite posts. I have decided that there is "local time & place" symbolism at play sometimes. This attitude allows for all meanings and analysis. Good call/find Elliott! I guess the 'pump' implies water pump and that person stands for prohibition or an anti-fun fuddy-duddy or similar. 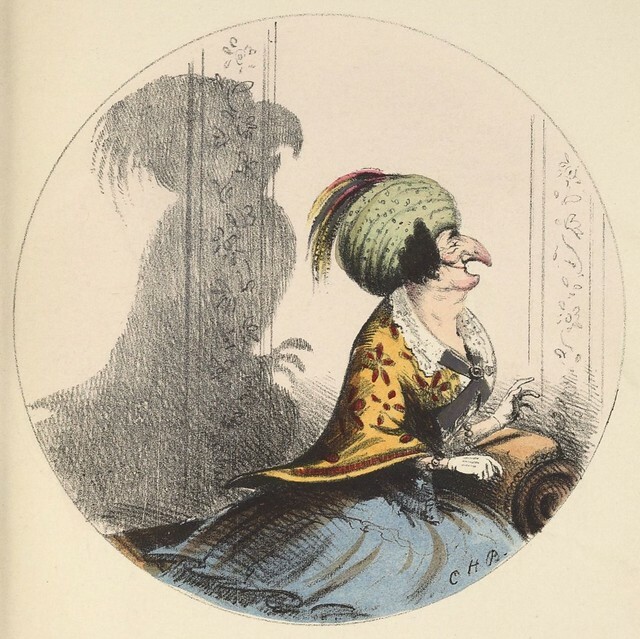 I spent a while searching around, but didn't find any other caricature prints or book illustrations with that symbolism. It's me I bet. That pump must have been a well known motif of anti-drinking mockery t'would have thought.